Service activity lost steam in September after touching a three-year high the month before. The finding, which comes after manufacturing too showed a slowdown, suggests mellowed growth in the private sector in the past month. 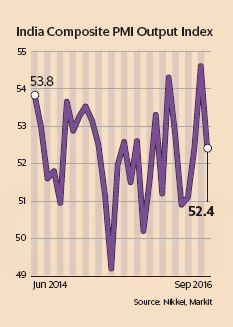 The Nikkei India Services Business Activity Index dropped to 52 in September from 54.7 in August. A reading above 50 in the index indicates expansion, while a figure below that shows contraction. 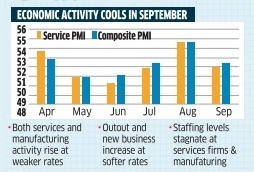 India's manufacturing slowed in September, after growing at its fastest pace in 13 months in August. Put together, the seasonally adjusted Nikkei India Composite PMI Output Index fell from August's 42-month high of 54.6 to 52.4 in September. Business optimism among Indian service providers fell in September, with the degree of confidence remaining below its long-run average.Challenging market conditions were frequently reported by panellists as a key factor weighing on sentiment. 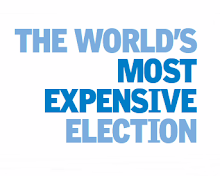 On inflation, the survey said prices charged were raised in line with the higher cost burden as rising food and petrol prices put pressure on operating costs which made private sector companies raise their own prices for the second straight month, although inflation remained relatively soft.